TU Wien has developed an engine that uses two different types of fuel simultaneously: it uses both bioethanol and diesel, which is used for ignition. A special duel-fuel combustion process has been developed for this purpose, which now enables the use of a large proportion of bioethanol in diesel engines. 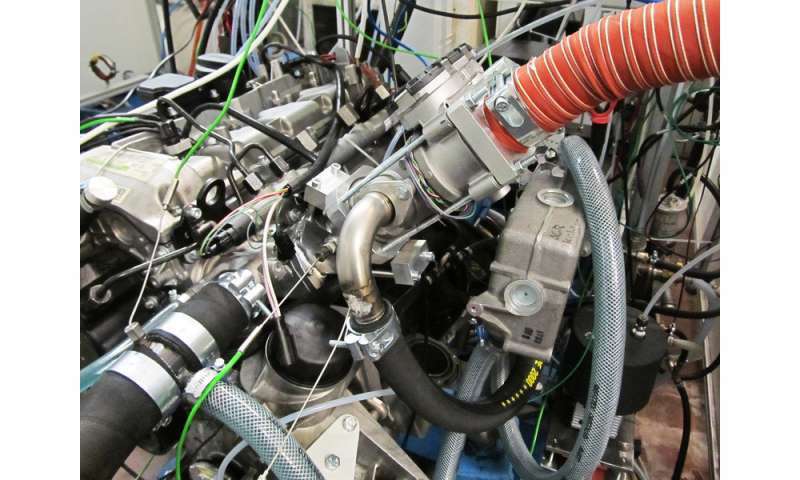 Measurements show that this new technology improves engine efficiency – overall CO2 emissions have been reduced by up to 39 percent. Besides the development of new and more efficient combustion engines, the fuel also plays an important role within the efforts to reduce the pollutant and greenhouse gas emissions produced by the transport sector. At TU Wien, the use of bioethanol as an additional fuel in diesel engines has been investigated. "In some countries, it has been common practice to add larger quantities of ethanol to petrol for a long time. However, until now doing this in diesel engines has only been possible to a very limited extent," says Prof. Bernhard Geringer from the Institute for Powertrains and Automotive Technology at TU Wien. If you were to simply mix bioethanol into the diesel tank, it would cause ignition problems. Bernhard Geringer and his team have therefore developed a dual-fuel combustion process. "Ignition is initiated by means of a direct injection diesel fuel jet, like in conventional diesel engines," explains Geringer. "In our model, however, the alcoholic fuel is added to the intake air upstream of the engine. It is then ignited after the diesel ignition in the combustion chamber. In a manner of speaking, the diesel functions as a spark plug for the bioethanol." In the tests carried out, the replacement of diesel with the alcohol fuel was gradually increased. These tests showed that up to 70 percent of the diesel fuel can be replaced with bioethanol – and this even had a positive effect on the efficiency of the engine: "We measured an increase in efficiency of up to 6.1 percent, and that alone improves the environmental balance of the engine," says Aleksandar Damyanov (TU Wien). "Of course, we must also consider the fact that bioethanol has an excellent CO2 balance because it is produced from renewable raw materials. When we factor that in as well, we find that there is an overall reduction in CO2 emissions of up to 39 percent." Various operating points were tested at an engine test bench at TU Wien – from a low engine load to high-load operation, over a speed range of 1500 rpm to 3000 rpm. In all cases, a significant reduction was recorded in the soot mass and number of hazardous fine dust particles produced (see table). "Our results clearly show that bioethanol can be successfully used as a substitute fuel in a dual-fuel diesel engine, and that this concept has significant benefits for the environment," says Bernhard Geringer. "In many areas, we will not be able to do without diesel engines in the medium to long term – trucks and tractors, for example. E-mobility has its limits here. With our dual-fuel technology, it is possible to significantly improve sustainability and emissions performance in these particular areas."